And you bet it we will be here. Last edited by auricuno on Thu Aug 01, 2013 6:19 pm, edited 1 time in total. 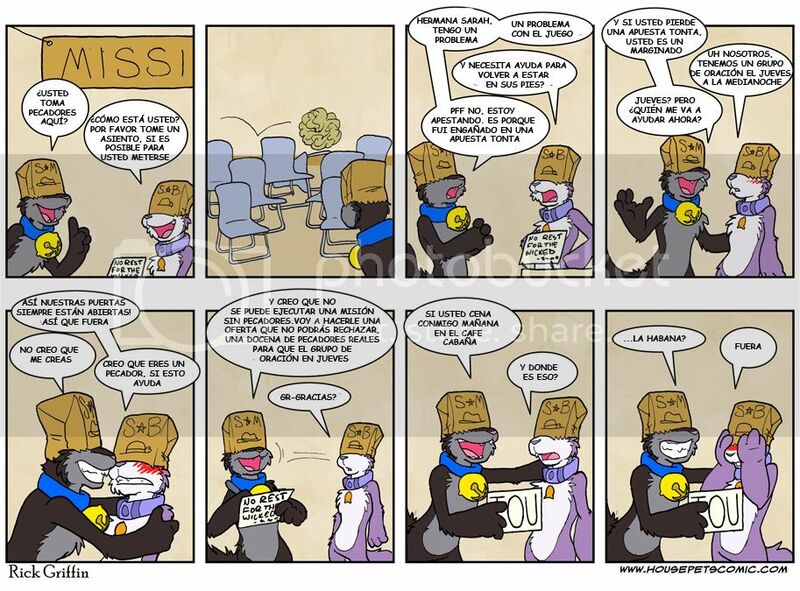 should change "que es una buena chica" for "quién es una buena chica"
this is my version I make for desperate like me, and when GREN rise of the the delete since mine is not as good as the work that I cast so far this is the first strip of the arc 56. Last edited by auricuno on Tue Aug 06, 2013 9:01 pm, edited 5 times in total. Last edited by eagle eye on Fri Aug 02, 2013 10:20 am, edited 1 time in total. I'm finally reading the comic page, I am in the the first game they do with tarot (for the eyes say it's dragon) when I realized that my English is not so bad because I understand the story. PS: Anyone know how I can make an account on the website to comment on the scetckes? No problemo, thanks for the favor! Hi guys, I've returned from my "magical" trip. (*ehem* sarcasm *ehem*). Hehe, it seems you've been occupied auricuno, though I recomend you to not rely too much on google translate because it isn't precise (you should have trust in your common sence and your own english' knowledge). I inform you that I've been working on the forum though it still need a couple of tweaks. The good news is that I can use it as a webpage adjusting the portals. The forum and the front page are already done, I'm actually working in the archive and the cast page. Of course my actions are limited but I'll try to do the best I can. By the way, when I finish with the forum I'll return to my usual irregular schedule of translations. However, I'll start to translate the current strips from now (the previous strips will be translated and uploaded to the archive meanwhile the current ones will appear in the front page and have their own discussion threads). Hi Gren, how you doing?! ok would start from where you left off or from where I stayed to see if I clear that I did? Hi Gren, good to read you again around here. Auricuno, I think you should start from where you feel it's the best. If you have the will to re-do your work it depends of you, otherwise you can continue from where you left. If you wonder what font I use, is "New Wild Words" (it's really easy to find and it's free). Besides, if you have a doubt or need me for correction just send me a PM and I'll help you whenever you need. Last edited by auricuno on Tue Aug 27, 2013 7:42 pm, edited 2 times in total. Fairly, a good job Auricuno. Just make sure to proofread the traslation before uploading. (Un trabajo bastante bueno, Auricuno. Solo asegúrate de repasar a la traducción antes de subirla. @Gren: Glad to hear you are back and Good to hear there's progress in the forum. Will be great for all the spanish speakers. Thank you legendario, and I apologize because the forum is progressing too slow. I'm really sorry but I'm having some personal troubles and probably I'll be moving shortly. However I'm still working on it, just needs some minor adjustments. I just hope that this worth for something because I'm still not entirely convinced if this was necessary if there is not much spanish-speakers out there. If you is very complicated Gren do not sweat it, leave it for another time, just thank you very much! Last edited by auricuno on Fri Aug 30, 2013 3:16 pm, edited 1 time in total. Calm down auricuno, I have told you that I'm moving soon so I have no much time to put on the translation for now. Besides I'm finishing the website so you have to be a bit more patiant, can you? All right, Auricuno, thank you very much again for the favor of the translations. JK, seriously, everybody, calm down. This translation proyect should be for fun and fun only. If it gets in your way no worries, put it on a side and get a hold of your bussiness first. hey, does anyone live here? It's a ghost town, the legend say that the people used to talk about one webcomic, but is only ghost stories. I'm sorry guys, I'm still over here but I have not so much time as I used. Housepets it's not the only thing I follow so I have to divide my free time in order to keep up with everything. However I been working on the forum and I decided to open it tomorrow though it's not finished yet. I can't promise that I'll return to my old pace on translations immediately but at least I'll try to translate the daily comics. To be fair, I didn't wanted to do this because I think there was no need since there's not a large hispanic community on this forum. I hate to assume more responsabilities but I did it for you guys, because you need it so badly. So if you want to give me some help I wouldn't mind. I mean, there's no much remaining to do on the website but I don't know if I'll have the time to participate and moderate the forum every day so I'll need someone who take charge on that. Okay, Gren, we were not rushing lol! You do everything you owe and do not worry! Okay guys, I keep my word and I'll open the forum right now. As you can see, the last comic is already translated, and you can access to its respective discussion thread. I had no time to create any other discussion thread so you are free to open your own threads and talk about whatever you want (as long as it follow the rules). The cast page is not finished yet and the archives are updated to my latest translations. Hope you like it, guys. Enjoy it. And now I need some rest. Today's strip has been translated.